Birthday parties can get out of hand quickly. If you’re tired of decorating and cleaning up, try these six ideas that take the pressure off so you can enjoy more of your child’s celebration. Birthday parties for young kids can become a huge production. Step back from stressful planning with easy birthday ideas that let you focus on celebrating. These six ideas help you be more present on your child’s big day. Before you balk at the idea of a dozen kids running wild in your home at 3 a.m., remember that you set the parameters of a sleepover. You don’t need to invite 15 kids. Let your child pick one or two special friends and put together a fun but simple agenda, such as popcorn and movie time. Kids love dressing up. Let them reuse their Halloween costumes at a costume party. Don’t go overboard buying themed party goods. Put together a fun playlist, set a small budget for balloons and let the kids enjoy being silly. Don’t forget to assign a few parents to camera duty. Invite the kids to goof off for the camera. In lieu of a traditional birthday party, give your child the opportunity to invite one or two friends on a theme park excursion. Tweens who are growing out of wanting a party will love this option. Depending on your usual party budget and local deals, this could be a cheaper option than throwing a big party. Weather permitting, staying outdoors is the best way to avoid stressing about hosting a bunch of people in your home. Contact your local parks and recreation department about reserving picnic benches at a family-friendly park or stay in the yard at your home. 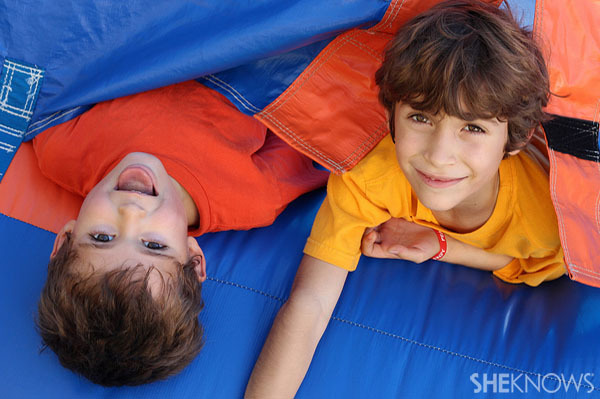 Contact local children’s museums, gymnastics centers and other kid destinations to price out birthday party packages. If you dislike planning and dislike cleaning even more, a party package is worth its weight in cupcakes. Let staff members handle the details so you can enjoy your child’s big day. While this party idea requires more preparation than some of the others suggested here, it’s easier than trying to coordinate every detail of a specific theme. Come up with an age-appropriate, simple craft. Bead necklaces, painted shirts, headbands and foam shields are just a few easy craft ideas. Set up a craft station as the main party activity. The finished products will be each guest’s party favor.